The Sargent cams listed below work for all applications except 16 inside and 50 outside. The equivalent Sargent cam is the 13-0660. 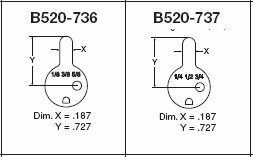 Use the B520-736 for modular cylinder lengths of 1 1/8", 1 3/8", 1 5/8"
Use the B520-737 for modular cylinder lengths of 1 1/4", 1 1/2", 1 3/4"